Some love him. Some hate him. Some REALLY LOVE to hate him. Whether you’re a basketball fan or not, you probably heard about “The Decision” in 2010. If you’re a LeBron fan, it marks the day you became a Miami Heat fan. If you’re a Cleveland Cavaliers fan, it marked the day LeBron broke your heart and was probably dead to you. Especially if your name is Dan Gilbert. I don’t know that James could have imagined his announcement would have been as divisive as it was. Still, there was an air and posture about the way it was done. What other player had a television special to mark his future NBA plans? Filmed far away from Ohio — to avoid visions of disappointed fans as he drove away. No disregard for the team he was leaving — told only minutes before the broadcast. No regret on the way he handled his free agency. Was he as “selfish”, “heartless” and “callous” for this “cowardly betrayal” as Cavs owner, Gilbert, called him?? Was the pomp & circumstance a necessity? Was it childish? If, indeed, he was KING James — did he really need to go join a superior team to get his ring? Was he working smarter, not harder or just trying to shortcut the hard work? Former NBA greats, like Michael Jordan & Magic Johnson made it clear that’s not how they would have done it… but did that, in & of itself, make it wrong for him? Wrong at all? In his essay, James admitted there wouldn’t necessarily be an instant championship, that things would take time. His patience would be tested. Still, he managed to lead the young roster to the first NBA Finals since his return. And tonight starts the fight for that ultimate prize. I’d be lying if I said I was always a LeBron apologist, so please know that, if you don’t already. I don’t wear LeBron-colored glasses. After Decision 1.0, I couldn’t stand the guy. I would root for whoever was playing Miami… if I had to watch at all. Seeing them beat the Spurs was torture. The Spurs redemption last year was amazing!! And yet, I started to empathize. He had no support in Miami. It was looking like the Cavs team he was running away from. Decision 2.0 won me over. I wasn’t instantly a fan, but I was impressed. I saw the maturity, the simplicity, the humility. The manner in which it was handled spoke of his growth. The chance he took returning to those who once burned his jerseys & sold his memorabilia — for the price representing the year Benedict Arnold was born — spoke to his resolve. As the season started, no one expected to see his team in the Finals. And he didn’t promise that. However, as the season progressed, I saw LeBron 2.0 emerging, not just a decision. The leadership he was displaying, the lack of ego. It was refreshing. Slowly, but surely, I found myself starting to not just watch his games — but root for him. As the playoffs started, I wanted so badly to see him get this team to the Finals, a shot at restoration. See, God will always restore what the enemy steals. He ALWAYS restores what the enemy steals. LeBron’s road back to the NBA Finals started reminding me of the story Jesus told of the Prodigal Son. In Luke 15, we see a rich man with two sons. The younger decided he wanted his part of the estate — & he wanted it NOW!! He didn’t just want his inheritance (championship), he wanted out (of Cleveland). So the father let him leave, inheritance in hand, regardless of the loss he would feel. It doesn’t take long for us to learn he “squandered his wealth in wild living” (Luke 15:13). After he had spent everything, there was a famine where he had moved to, and he found himself working with pigs, but not even having the food they ate to fill his stomach. He “came to his senses” & realizes his father’s servants live & eat better than he is currently. He decided to return home. Before he even arrived, his father spotted him in the distance, as if he spent a great deal of time waiting for such a time. The son pleads his case to be a servant, but his father has already started shouting orders of grandeur & celebration for his lost son, returning home. LeBron promised work. He came back willing, like the son, to put his head down and earn back what he wanted. A championship for his home team. He didn’t anticipate the season they’ve had, but I think that’s why it speaks to me so much. I love the idea of everything Cleveland lost not just being found, but restored. Some LeBron fans & some Cleveland fans alike were baffled &/or angry by the return of the Prodigal Son, as was the older brother in the story. Those who were LeBron defenders didn’t want to see Dan Gilbert profit at his return after all that Dan had done after Decision 1.0. Still, LeBron let it be known the second time around that forgiveness was a part of the process & that mistakes had been made on both sides. This was a chance, again, to restore all of those bad decisions. A shot at redemption. The manner in which the son leaves is all about him. EGO. The posture in which the son returns is all about the father. Decision 2.0 demonstrated the posture of a man humbled; by some bad choices and poor representation of the type of man he wants to be remembered for, not just to the game, but to the city he came from. It confirmed a man who didn’t want an inheritance (championship) just thrown at him, but one that was earned. So for this Prodigal Son — returning to the NBA Finals, sooner than he ever could have hoped — my hope is redemption. My hope is for restoration of everything that was lost. And my hope is for all those who, like the older brother, hate this man — for his leaving — for his return — for no reason at all — that you might understand a little more clearly through this Prodigal Son and through the entire message of the Gospel that “God causes everything to work together for the good of those who love God and are called according to His purpose for them” (Romans 8:28). That means the leaving, the hate AND the success that followed, then the failure that followed as well as the return home & this road back the Finals. 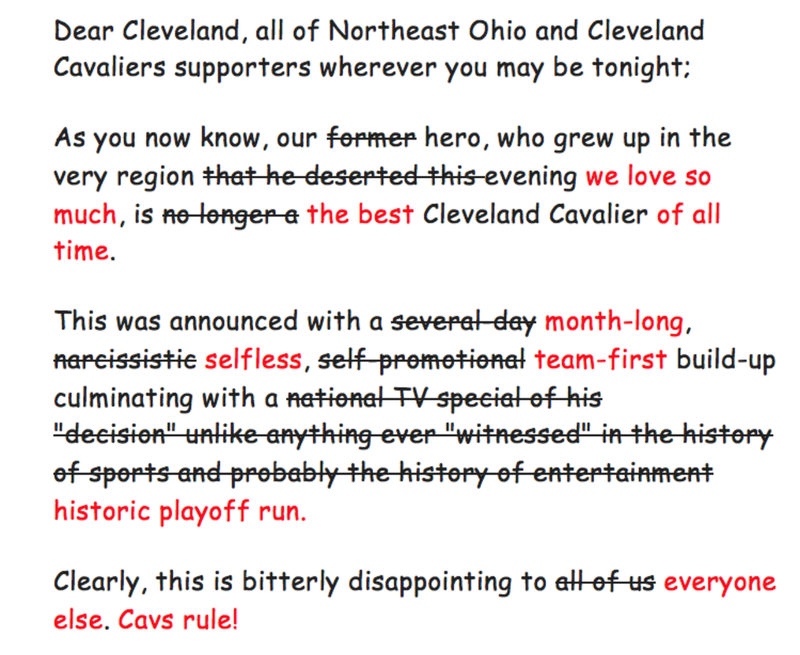 And if it needed to be said, go Cavs! I’m ALL IN! !